For many years, state and federal officials have grappled with the challenge of effectively integrating and coordinating the operation of multiple health and human services programs that serve overlapping populations. Such efforts can yield many gains. When one program determines eligibility based on the work already done by another program, it simplifies eligibility determination, lowering public-sector administrative costs while streamlining the enrollment and retention process for consumers. The latter goal is particularly important for low-wage, working families, as taking time off from work to seek public benefits can place employment at risk. A streamlined process removes barriers to accessing services, helping more eligible people obtain promised benefits in uncapped programs like Medicaid and the Supplemental Nutrition Assistance Program (SNAP). Agencies can lower administrative costs by jointly procuring or operating shared systems for eligibility and enrollment, thus benefiting from economies of scale and more highly-leveraged purchasing power. Multiple programs working together can develop administrative capacities beyond the reach of any single program operating alone. And when agencies benefit from one another’s work to assess the circumstances of low-income households, they can more easily detect ineligibility, safeguarding program integrity. Many barriers stand in the way of fully realizing these opportunities. Depending on the circumstances, such barriers can include perceived or actual legal limitations on information sharing, differences between programs’ technical rules for defining such things as household size and income deductions, outdated information technology (IT) systems used for eligibility purposes, federal or state statutes that make integration or coordination difficult, competing demands for the staff time and other resources needed for innovation, and the absence of strong relationships between agencies that administer different programs. The 2010 enactment of the Patient Protection and Affordable Care Act (Affordable Care Act or ACA) has sparked discussion of new possibilities for program integration and coordination. To implement the legislation’s vision of 21st-century, data-driven eligibility determination, the federal government has offered significant funding to help cover the cost of necessary modernization of IT for health coverage, which can also benefit human services programs. In states that implement the Affordable Care Act’s Medicaid expansion, more low-income people will qualify for insurance affordability programs (IAPs)—that is, Medicaid, the Children’s Health Insurance Program (CHIP), and subsidies for individual coverage in health insurance marketplaces—than for any other need-based program. If IAP beneficiaries apply for human services programs, the latter might achieve efficiency gains if they can leverage the work that health programs have already done to determine consumers’ eligibility. And programs like SNAP seeking to reach eligible nonparticipants could use IAP records to target outreach efforts and serve additional eligible households. At the same time, many uninsured consumers who will newly qualify for health coverage under the ACA already participate in human services programs. If IAPs could utilize case records from human services programs to streamline eligibility determination and enrollment into health coverage, many uninsured Americans could receive coverage without burdening social services offices with the manual processing of IAP applications. 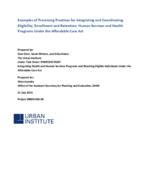 In view of these possibilities, the Office of the Assistant Secretary for Planning and Evaluation of the U.S. Department of Health and Human Services (ASPE/HHS) initiated a study—Integrating Health and Human Services Programs and Reaching Eligible Individuals Under the Affordable Care Act—of which this paper is a part. Here, we describe examples of state, local, and private efforts to integrate and coordinate eligibility determination, enrollment, and retention. We focus on promising examples that other states, localities, and private organizations can adapt, replicate, and improve. Some of these practices were already under way prior to the ACA, and others began in response to the ACA. Streamlining eligibility for one program based on data linkages with another program. We include programs that changed their eligibility rules so that, when consumers have already demonstrated eligibility for one program, they do not need to provide the same or similar information to qualify for a different program. We find that such innovations have both streamlined enrollment for consumers and reduced public-sector administrative costs. Coordinating administration of multiple programs. In this category, case study states use a single automated system to help determine eligibility for multiple programs. The resulting economies of scale have let multiple programs achieve administrative savings while implementing functions that no single program could easily achieve on its own. Coordinating outreach and enrollment. This category includes both public- and private-sector strategies to help consumers learn about and qualify for multiple services or benefits atthe same time. These key results, challenges, and lessons learned from these case studies are summarized in Tables 1 and 2. We conclude the body of the report by describing strategies of multi-program integration and coordination that initially appeared promising but that have not yet resulted in notable gains. We then present two appendices, the first of which briefly lists examples of other promising innovations that resource constraints prevented us from exploring in detail. We briefly describe those examples and suggest additional sources of information for the interested reader. Our second appendix lists members of this project’s Technical Working Group, who have provided invaluable guidance and assistance, both with this paper and other parts of the project. Louisiana Medicaid/CHIP renewal through multiple strategies, including data matching More than 3 in 4 (76%) of Medicaid/CHIP children’s renewal is based on data; nearly all children (95.4%) have eligibility continue at renewal; <1% lose coverage for procedural reasons. Louisiana Express Lane Eligibility (ELE): children receive or renew Medicaid based on SNAP receipt unless parents opt out During 2010, ELE provided Medicaid to approximately 18,000 uninsured children, representing a 3% total increase for Medicaid/CHIP children. ELE renews 20 percent of all Medicaid and CHIP children. Net administrative savings of roughly $1 million per year. South Carolina ELE: children receive or renew Medicaid based on SNAP or TANF receipt unless parents opt out Medicaid provided to more than 92,000 uninsured children, increasing total enrollment by 15 percent. More than 276,000 children renewed through ELE. Net administrative savings of $1.6 million per year. Food and Nutrition Service SNAP/Supplemental Security Income (SSI) Combined Application Projects (CAPs): SSI recipients receive SNAP. SSI data establish (a) standardized benefits or (b) standardized shelter costs, which result in individually determined benefits. From 2000 to 2008, CAP states experienced a 48% increase in SNAP participation levels among 1-person SSI households, while other states saw little change. Utah Automated electronic eligibility system: a combined system of electronic case records, rules engine, data match system, on-line applications, benefit payment system for multiple health and human services programs From 2008 to 2010, the caseload that can be handled by a single worker rose by 53 percent. From 2009-2010, caseloads grew by 12.3 percent as total operating costs fell by 9.6 percent. Minnesota Enrollment into Medicaid expansion based on (a) toll-free number for hospital emergency rooms and (b) manual conversion of records from prior state health program 51,583 indigent consumers enrolled by end of the first month, March 2011—68% of all consumers enrolled by the end of 2011. Single Stop USA Community organization helps community college students and their families enroll into health and human services programs, provides financial and legal counseling 29% of counseled students received health and human services benefits in 2012, averaging $5,400 per student. More than half of students also received financial or legal counseling. Louisiana Medicaid/CHIP renewal through multiple strategies, including data matching Continuing improvement possible. Requires significant work from state staff and meaningful involvement of front-line case workers in developing policy. Louisiana ELE: children receive or renew Medicaid based on SNAP receipt unless parents opt out Considerable work, time, and patience needed from staff. Children who do not use their cards to access care typically do not renew coverage. South Carolina ELE: children receive or renew Medicaid based on SNAP or TANF receipt unless parents opt out Separate agencies had to overcome differences in data collection methods. To address limited provider capacity, implemented ELE enrollment incrementally, by county. Caseworker confusion resulted from lack of training in advance of implementation. Food and Nutrition Service SNAP/SSI CAP: SSI recipients receive SNAP. SSI data establish (a) standardized benefits or (b) standardized shelter costs, which result in individually determined benefits. Streamlined enrollment requires standardized benefits or shelter costs, which are sometimes different from levels that would result from normal SNAP processes. Despite notices, few CAP participants know they can obtain an individualized benefit determination by filing a regular SNAP application. Utah Automated electronic eligibility system: a combined system of electronic case records, rules engine, data match system, on-line applications, benefit payment system for multiple health and human services programs Considerable time and effort required. State used consultants and vendors selectively and strategically. Rules engine hard to implement with policies that have ambiguities. Gradual “roll out,” with careful testing, avoided problems. No evidence of increased participation by eligible consumers. Minnesota Enrollment into Medicaid expansion based on (a) toll-free number for hospital emergency rooms and (b) manual conversion of records from prior state health program Doing manual record conversion was administratively costly, as a trade-off for significant early enrollment before IT improvements were ready to implement. Single Stop USA Community organization helps community college students and families enroll into health and human services programs, provides financial and legal counseling School staff needed to go beyond educational goals so students could have broader needs met. To overcome stigma associated with public benefits, services framed within the context of financial aid available to students. Organization had to learn to work within the college environment, requiring less aggressive approaches than in other environments.